(Distanza massima di 100 m). Perline lampada: sorgente di luce COB. Riguardo a noi. Non aprire un caso prima di darci la possibilità di risolverlo! 1 Cavo di ricarica. We will work with you to resolve any problem you may have. New Arrivals. perline lampada: sorgente di luce brillante COB. 1 x Instructions. 1 x Cable ties. 1 x Mounting screws. 1 x Installation Wrench stools. 1 x USB Charging cable. 1 x Remote base. 1 x Alarm Holder mount. 1 x Alarm taillight. Un grande assistente per gli appassionati di mountain bike. - Applicazione: bici / mountain bike. - Perline LED ad alta luminosità COB, 3 modalità luce con flash veloce, flash moderato e fisso, facile da notare di notte e area con scarsa visibilità. It uses hidden mounting design and USB charging mode, not only easy to operate, install and Lightweight appearance but also highly Portability ,waterproof and weatherproof. wireless remot e. Four button(From top to bottom):Lock/Unlock/Flash/Wireless bell. ♭COB NIGHT CYCLING LIGHT: The Taillight can switch in 4 modes which is Burst flash, Fast flash, Always bright, Light closed. It's safety for you to cycling at night. LED Lamp Beads: COB bright light source. Burglar Alarm. Bicycle Taillight . When the speed is detected suddenly slowed down, the taillight is automatically highlighted for about 2 seconds, and the rear vehicle or pedestrian is given a safety warning;. 1 Cavo di ricarica. 3 Fascette. 2 L Chiave. Colore nero. 1 Instruction. 1 Cavo di ricarica. width: 0 x height: 0 x length: 0 x weight: 0. Materiale: ABS PC. Unico e fashion Desigh, varie scelte. USB ricaricabile. ◎ RICARICA VELOCE — Built-in batteria Li-lon 800 mAh, tempo di ricarica è di 6 ore dopo una carica completa. Può essere caricata da banca di potere, PC o DC, e cavo USB inclusi. This multi-function taillight is integrated in the 3 in 1 (siren taillight bell). So you can find your bike in darkness easily by functioning light on or sound on. WIRELESS BELL: The alarm decibel is up to 120. Wasaga Bike Fanale posteriore con telecomando per allarme, Bell, e COB POSTERIORE. ♭COB NIGHT CYCLING LIGHT: The Taillight can switch in 4 modes which is Burst flash, Fast flash, Always bright, Light closed. It's safety for you to cycling at night. Can set this function with【Lock】【Unlock】and the way to setting is easy and convenient. Ultra-high 120 db alarm, three modes to change, wireless bell function, remote alarm function. Model Number: bicycle light. 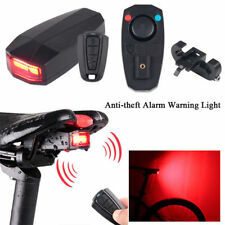 1 x Wireless Alarm Bike Bell. Color: black. Due to the difference between different monitors, the picture may not reflect the actual color of the item. Perline luminose brillanti, 3 modalità flash: flash / normale / flash lento. 1 Cavo di ricarica. Tipo di uso: ciclista, appassionati di bici. 3 Fascette. Livello: Professionale. Materiale esterno: Plastica. 1 Cavo di ricarica. Nuovi Arrivi. 3 Fascette. 2 L Chiave. 1 Instruction. Model: Smart vibration sensitive alert & COB bright taillight. Wireless electric horn to alert others or cars while riding thru traffic. Safety taillights : keep you and your bike in safety. Instantly produce super loud alert sound to scare the thief away when certain vibration is detected. - Protect your bicycle from crafty thefts. - Convenient clip mount, easily install to the bicycle handlebar. It uses hidden mounting design and USB charging mode, not only easy to operate, install and Lightweight appearance but also highly Portability ,waterproof and weatherproof. Applicable models:Normal installation is for bicycle saddle bracket width distance 5-7cm(Any bike models and sizes). 1 x Bandage. Alarm sound: 120 decibel. Remote Alarm function. Battery: 3.7V 800mA lithium battery. Ultra-high 120 db alarm. Wireless Bell function. 1 x Alarm taillight. Mode: 3 modes. Function:Rear Light,Alarm Lock,Bell,Bike Night Location. Alarm Decibel:105-120db. Remote Distance:0-50m. When an alarm is locked, it is sensitive to vibrations. Protect your bicycle from crafty thefts. Utilize vibration sensor for detection. Instantly produce super loud alert sound to scare the thief away when certain vibration is detected. This multi-function taillight is integrated in the 3 in 1 (siren taillight bell). So you can find your bike in darkness easily by functioning light on or sound on. BRIGHT LAMP BEADS: COB super bright light beads, 3 flash modes: flash / normal / slow flash. Features: 100% brand new and high quality Easy and convenient to install. When an alarm is locked, it is sensitive to vibrations. Protect your bicycle from crafty thefts. Utilize vibration sensor for detection. Instantly produce super loud alert sound to scare the thief away when certain vibration is detected. Attached with a remote control for added convenience. 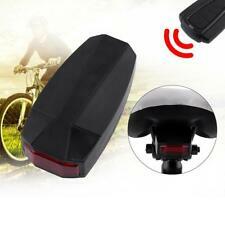 Convenient clip mount, easily install to the bicycle handlebar. .
Category: Bike tail lamp. Power: Battery. Light color: Red. Mode: Four gears(Adjustable). The light can be install on saddle or seat tube, you can free to choose, we have two holders. This little laser beam tail light will ensure your safety while riding in the darkness. It has multi LEDs and 2 laser bulbs. The LED and the laser work independently. 1 x Bicycle Laser Beam Rear Tail Light Lamp. 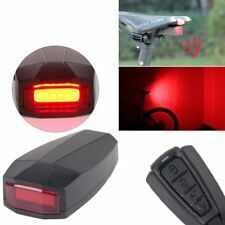 Features: 100% Brand New and high quality 7 kinds of flash mode: Always bright, flash, slow flash, left to right, right to left and left to right slow flash, flash, flash back and forth 2 laser lights remind someone else of keeping distance, add safety?This little laser beam tail light will ensure your safety while riding in the darkness. Note : Do not look directly at laser lights Waterproof, safer in water fog when riding in the rain Use for jogging, walking, bicycles, car emergency, horse–riding, road emergency & camping, ETC. Working time: About 9hours Specifications: Working: 9-36 hours depends on the batteries Power: 2 x AAA batteries (not included). 1 X Bike LED front lamp. Apply for: Tube dia 24mm(Inner tube). 1 X Firm clip. Item size: 9 3.3 3.8cm line length 25cm. Switch: 4 button random changed sound. Color: Black. Battery: 2pcs #5 battery(Not included). 1 X Bike LED front lamp. Apply for: Tube dia 24mm(Inner tube). 1 X Firm clip. This is to safeguard the best interest of both parties. Item size: 9 3.3 3.8cm line length 25cm. Switch: 4 button random changed sound. Anti-theft function, the light is equipped with advanced sensor that can make alarm when it's moved to keep your bike safe. Alarm Sound: 105-120db. Mode: steady on, flash, strobe. Waterproof: IP6. Tail Light Size: 5 4 4cm / 1.98 1.57in. Anti-theft function, the light is equipped with advanced sensor that can make alarm when it's moved to keep your bike safe. Alarm Sound: 105-120db. Mode: steady on, flash, strobe. Tail Light Size: 5 4 4cm / 1.98 1.57in. 1 X Bike LED front lamp. Apply for: Tube dia 24mm(Inner tube). Battery: 2pcs #5 battery(Not included). 1 X Firm clip. Item size: 9 3.3 3.8cm line length 25cm. Switch: 4 button random changed sound. Color: Black. Burglar Alarm √. Alarm Sound Super Alarm More Than 120 dB. Lamp Beads COB Highlight Llight Source. â‘ Trigger conditions: in the dark, the vehicle vibrates. The factory default triggers a red light flash. Luminescence ultra-bright LED, no flicker and lowest power-consumption. With 5 LED bulbs, whose luminance reach 11 000 â????. 13 000 and operated - duration is till 110 000 hours. Multi-function, guiding your way in the darkness. During the weak light circumstance, any motion happened to your bike, the light will be automatically on in the defaulted mode, the 1st gear or the 2nd gear mode, and it will be automatically off under motionless for 30 seconds. Motorcycle Parts. Motorcycle Fairings. 1 Pair Wheel Lights. Shell Color: Silver. Shell Color:: Silver. Light Source: LED. Item Type: Warning Lights. Car Model: Octavia. Light emitting mode: 6 modes(20% Luminance, 50% Luminance, 100% Luminance, 50% Flashing, 100% Flashing, Burst Flashing). This product is used for bicycle front or rear light, easy to install, easy to use.